The image that is seen here is one of several images that were found undocumented in the archives of the Mamaroneck Public Library. This image, along with the others, will be incorporated into a presentation about the history and the building of The Mamaroneck Public Library and community center that will be posted on their website. 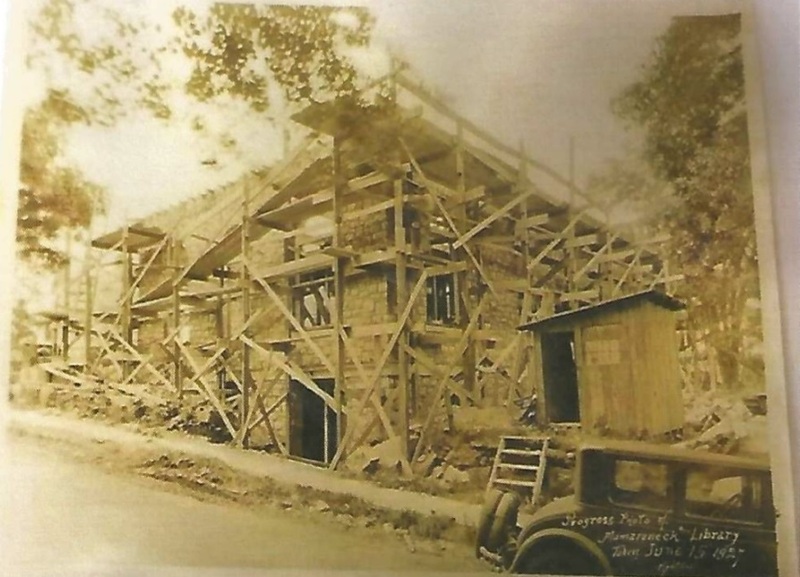 This image (circa 1927) shows the construction of the original Mamaroneck Public Library on Prospect Avenue, which was completed by September, 1927. At the time, there were almost 7,000 books in the library. By 1966,a new wing was added, to include the current reading and reference rooms and children’s library (Fulcher 1947). Soon after, The Emelin Theatre and a lower level expansion were added. By 1987, a wing was added to allow The Emelin Theatre to move, and become a separate entity. In both 2008 and 2011, further expansions brought the library to its current size, almost twice its original size. It hosts an amazing 124,000 items, 83,000 of which are books (History of The Mamaroneck Public Library n.d.). It still serves as a major contributor to Mamaroneck as a cultural and community center, keeping the dream from back in the early 1900’s of a resource for all of the citizens of Mamaroneck alive. Before the mid 1800’s, most substantial libraries in the state of New York were privately owned, built by religious organizations, or located in major cities such as Manhattan (The New York Public Library), White Plains, or Albany (The New York State Library). Local municipalities and public schools did not have the funding or the resources for books and materials for use by the general public. Exposure to books, music, art and other cultural and educational materials was limited for people who did not have the resources to access them. Over time, the idea that library resources should be made available free of charge to the general public took hold. People with means began to donate funds and books to help build public libraries (History of NY Public Library, n.d.). The Village of Mamaroneck is one of the older villages in Westchester County. Purchased in 1661, it quickly was established as a trading post for smugglers who were trying to evade the harsh import penalties of the British Crown. While still small in population, and considered “the country” for those who lived in Manhattan, Mamaroneck began to become more concerned with the quality of life of its residents (Lippsett 1997). In 1922, resident Charles M. Baxter would begin his campaign to build a public library in Mamaroneck. Armed with the slogan “Mamaroneck is not a fit place to live in until it has a Library,” and a dedication to the people of Mamaroneck, Baxter would eventually see his dream of a public library come to fruition (LoGiudice 1995). It soon became obvious that the community of Mamaroneck wanted to build a center for their community. A small, store front building on West Post Road was quickly established with private funding and donated resources. Donations as small as fifty cents to thousands of dollars poured in. Baxter soon approached the Hegeman Estate (of the late John Rogers Hegeman of the Metropolitan Life Insurance Company) and secured the sizable donation of forty thousand dollars to build the Mamaroneck Public Library on Prospect Avenue. Again, donations large and small from various sources poured in, allowing for the purchase of the property, the design of the architecture, and the building of the Library itself. The slogan “A book given to the Library is a gift to everyone who uses the library” netted thousands of donations of funds and books from citizens of all ages (Fulcher 1947). The new library was becoming a reality. Over time, this Library would serve as a Red Cross Headquarters, supply distribution center, emergency shelter, teen center, and a trusted resource for up-to-date, accurate community information, for people of all walks of life. Fulcher, William. 1947. The Story of A Dream: The Mamaroneck Free Library: Town of Mamaroneck Publisher. “History |.” n.d. Accessed March 10, 2018. https://www.nypl.org/help/about-nypl/history. “History |.” n.d. Accessed March 10, 2018. http://www.mamaronecklibrary.org/history-3/. Lippsett, Paula B. 1997. Mamaroneck Town: A History of “The Gathering Place”, 1661-1997. Mamaroneck, NY: Town of Mamaroneck Publisher. LoGiudice, Mary P. 1995. Celebration: Village of Mamaroneck Centennial, 1895-1995. Mamaroneck, NY: Printcraft. This entry was posted in Mamaroneck Public Library and tagged Academic Service-Learning, construction, Mamaroneck NY, mamaroneck public library, photograph. Bookmark the permalink.